You may have noticed I haven’t been running the Ask About Orthodoxy series lately. I felt like Orthodoxy was taking over my blog, and I needed to step back for a bit and reflect. I definitely want to address Orthodoxy here, but I also want to write about other topics. So I will continue to run the AAO series on the first Monday of every month until the end of the year, and then I will determine if there is still interest. Find all the AAO posts under the “Eastern Orthodoxy” tab at the top! Feel free to send me your questions about Orthodoxy via email, in the comments, on Facebook, or on Twitter. Today’s question is Why do Orthodox Christians fast? Orthodox Christians fast because we seek to unite body and soul. Ours is a physical faith because what we do with our bodies is as important as what we do with our minds and hearts. We fast before liturgy to prepare ourselves both physically and spiritually for Christ. We don’t want anything getting in the way of our focus on Christ, not even food in our stomachs. When I feel hungry during liturgy, it makes me eager for Eucharist, for partaking of the body and blood of Christ, and for eating a piece of blessed bread. As the priest drips the bread and wine onto my tongue, both a spiritual and a physical hunger are fed. Regular Wednesday and Friday fasting helps me remember Jesus’ betrayal and death, respectively. On those days, when I am tempted to eat something with meat or dairy (usually something with milk chocolate), I picture Judas kissing Jesus’ cheek, and I remember my priest nailing Jesus to the cross on Holy Thursday. And I usually can stop myself. If Jesus could die for me, I can avoid a piece of chocolate for him. But fasting is more than just avoidance or self-denial. The thing about self-denial is that it usually comes with pride. When I avoid that piece of chocolate, I think, Good job, Karissa! You did it! You exercised willpower! Fasting is a way to grow spiritually. I say that, but I struggle to explain it in words. It is an understanding I have come to in my soul. If I am fasting just to praise myself, then I am not truly fasting. I fast because it is hard, and as a culture we rarely make ourselves do hard things anymore. We live a life of convenience and ease, and it starves our spirits. In our fast-paced, busy world, we yearn to slow down, to hear silence, to sense something meaningful in all the chaos. Fasting is a way to do that. It’s a way to simplify, to weed out all the extras. It’s a way to learn how to live without extravagance so that we can learn to live with truth. As always in Orthodoxy, the physical act is deeply connected to the spiritual life. All that said, I have a confession: Other than pre-liturgy fasting, I don’t fast very much anymore. I was really gung-ho on fasting for a long time, but eventually as my kids grew older and pickier, it became very stressful for me to figure out what food to buy and cook that fit with fasting requirements that my family would actually eat. Even when I was fasting fairly regularly, there was never an entire liturgical year when I kept the fast 100%. In Saint John Chrysostom’s famous Paschal homily, he says, “If any have tarried even until the eleventh hour, let him, also, be not alarmed at his tardiness; for the Lord, who is jealous of his honor, will accept the last even as the first; he gives rest unto him who comes at the eleventh hour, even as unto him who has wrought from the first hour.”⁠ It seems that the Lord and the church still receive me even if I haven’t fasted enough. The true Orthodox experience actually alternates between fasting and feasting. 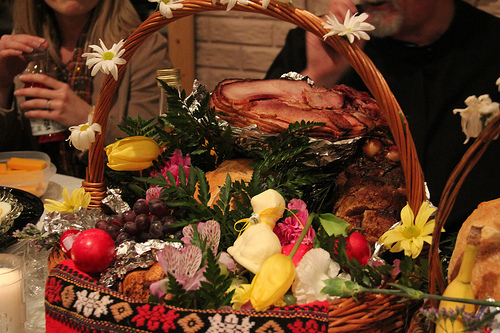 Feasting is a huge part of Orthodox spirituality. Both fasting and feasting are a huge part of Jewish and Christian history. Feasts and festivals were a normal part of Jewish life, both in Jesus’ time and today. Father Alexander Schmemann wrote, “For the man of the past, a feast was not something accidental and “additional”: it was his way of putting meaning into his life, of liberating it from the animal rhythm of work and rest. A feast was not a simple “break” in the otherwise meaningless and hard life of work, but a justification of that work, its fruit, its – so to speak – sacramental transformation into joy, and therefore, into freedom⁠.” It is not an accident that Jesus broke bread with his disciples during the Passover feast. It means that we are supposed to come together to celebrate and eat. For me, faith has always meant food and fellowship. Who hasn’t experienced the joy of a church potluck? Who hasn’t been the curious child marveling in the novelty of unique foods lined up on the long serving table? We would pile our plates high and only eat about a fourth of what we got, abandoning the food for playing tag in the Sunday School rooms. For years, the Knox family has crowded into my grandmother’s house on Easter and Thanksgiving to share a meal. My dad is usually the one to pray the blessing, and we clasp hands in a moment of held breaths, in awe at our happiness. In Thailand, all the church members ate lunch together at church after the service. It was understood that we worshipped together, and we broke bread together. The two went hand in hand. At St. Ignatius, there is always a coffee hour after liturgy. Of course, by 11:30, everyone is famished. The children rush into the fellowship hall and gather around the food table, anxiously waiting for the priest to bless the food. It’s time to break the fast. To celebrate that we have been blessed by the presence of Christ in the liturgy. The twelve Orthodox feasts are times of celebration and plenty. After Pascha (Easter), you can walk into our fellowship hall and see some tables adorned with tablecloths, flower arrangements, and fine china. There are baskets and platters of food everywhere. People will walk around handing out huge slices of bread or delicious meatballs. It is a time of sharing, laughter, and food. Much like the fried cornbread that ties me to memories of my Southern family and the somtam that reminds me of my Thai friends, Pascha is a time for red eggs, cheese, meats, and wine. For forty days, we have resisted these foods. We have exercised self-control and pushed away self-will. We have learned what it means to eat and live simply, to rid our lives of excess, and to focus on what’s important. And now, on the forty-first day, we feast. We allow ourselves a time of rejoicing and fullness. We celebrate Christ’s resurrection not just with our minds, but with our bodies. This is what it means to be Orthodox: to live a both-and life. To know God both in fasting and in feasting. To know God both in times of scarcity and in times of plenty. To know God with both our senses and our hearts. ** A portion of this post was lifted from my manuscript about converting to Orthodoxy, Transfigured Faith.